『大方廣佛華嚴經』貞元本 卷八은 唐의 般若가 晉本인 60華嚴經과 周本인 80華嚴經 중의 「入法界品」만을 번역한 것으로 제8권에 해당하는 「入不思議解脫境界普賢行願品」이다. 판각의 手法 등이 현존하는 다른『華嚴經』의 판본과는 그 품격이 다르다. 아마도 현종 12(1021)년 8월에 顯宗이 부모의 명복을 빌기 위해 玄化寺에서 판각한 판본이거나 문종 5(1051)년 정월에 眞觀寺에서 판각한 판본일 가능성이 높다. 국내에서 보기 드문 26行 17字本의 희귀본으로서 佛經과 佛敎學 및 書誌學의 硏究에는 물론 고려시대 목판인쇄문화의 연구에도 크게 활용될 수 있을 귀중한 자료이다. This book, the eighth volume of the Avatamsaka Sutra in the Zhenyuan Version, contains “The Practices and Vows of Samantabhadra Bodhisattva” selected from the Gandavyuha Sutra, which was translated by a Tang monk named Prajna (795-798) from the Avatamsaka Sutra in sixty fascicles of Jin version and eighty fascicles of Zhou version. 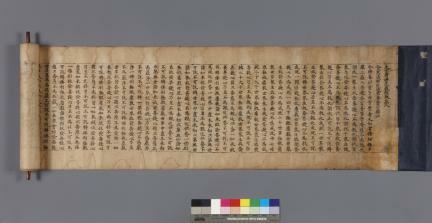 The technique used to carve the woodblocks with which it was printed shows its superiority to other editions of the same sutra. 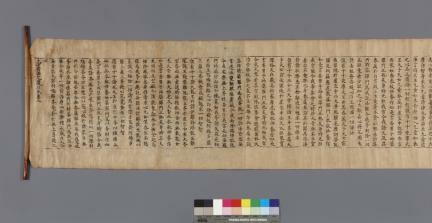 The book is also widely regarded as a rare, valuable material for bibliographical studies of Buddhist scriptures and woodblock printing in Goryeo due to, among other things, the page format in which each line of text consists of 26 lines and 17 characters.